To learn how to develop and simulate a mathematical model using a markup language. Systems biology is deals with mainly modeling of biological systems at a system level. The main purpose of CellDesigner is to draw networks using the symbolic notation, this system is proposed by Kitano. It is easy to retrieve the model from the databases. CellDesigner helps to create and simulate a model mathematically. Simulate the reaction by changing conditions of TIME Vs Substance. In this experiment, user can learn how to create and simulate a model using Systems Biology Markup Language (SBML) in CellDesigner. CellDesigner can stores all the model information and interaction informations in SBML file format. The model which has been created in the CellDesigner, will be saved it in the complete SBML document. 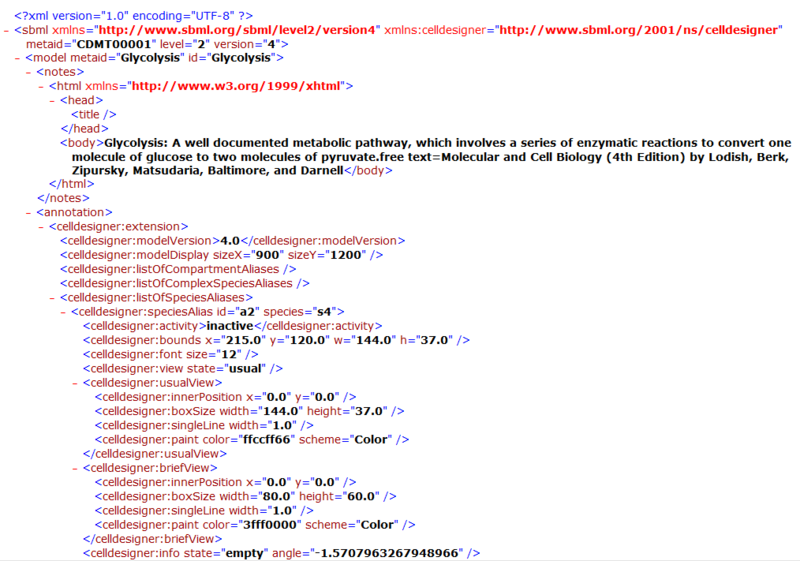 Systems Biology Markup Language (SBML) is a xml (eXtensible Markup Language) based language. It is a description language for simulations in systems biology. SBML is suitable for representing biochemical networks, which includes cell signaling pathways, metabolic pathways, biochemical reactions, gene regulation, and many others. It is a represented format of computational models. Modeling process involves the following steps. SBML allows models of uniformed complexity to be represented. Each type of model is described using a specific type of data structure which organizes the relevant information. 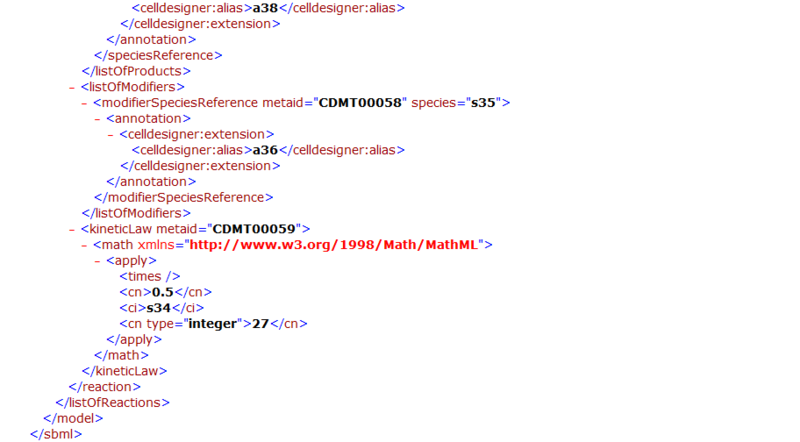 The data structures concludes how the resulting model is encoded in XML. Parameters in the rate law. In SBML Level 1 Version 2, the term specie has been replaced with the species throughout the speciﬁcation. Models written in SBML Level 1 Version 2 format should use the new spelling.SBML Level 1 Version 2 should accept both spellings on input for all elements and attributes where the term occurs. Each species in the pathway is replaced by specie id ,like in glycolysis glucose can be represented as [S1]. In this level, all the enzymes are represented away from the reactions [mentioned separately]. In SBML Level 2, the specie spelling will be removed entirely and only species will be used. Finally, note that the deﬁnition of Species in SBML requires a species in a model to be located within a compartment. That compartment should defines any species. One exception in this case is degenerative models does not have any species or reactions. SBML Level 1 supports non-spatial biochemical models and the operations that are possible in existing analysis or simulation tools. The potential features that have been intentionally omitted from the language deﬁnition in Level 1. We except that subsequent release of SBML will add the possible features which are not included in Level1. As mentioned above, SBML Level 1 provides the most basic foundations for modeling biochemical networks. Some of the signiﬁcant features that are missing from Level 1; these will be included in next Level of SBML. In SBML, level 3 is defined as a latest version which is having a defined core set of features and optional packages adding features to the core. In this approach model can declare which feature sets they use and software tools they can declare which packages they support. SBML Level 3 package development is today an ongoing activity. The additional features that are likely be included in SBML Level 2 or 3 are Arrays, connections, Database Interoperability, Geometry, Submodels, component Identification, References, Diagrams. Example of SBML file format is shown below. The SBL file which has been generated from the modeling and simulations done by using CellDesigner. Body: It defines the information and details about the model. Function : Which can give list of function definition. compartment representations are Id,Name, Units, Spatial dimension, Constant. etc.. Species: It corresponds to the objects or substances in the model. Parameters : It represts the different parameters required to develop a model. Rules: Three types of rules can be defined in a model. Reaction : Corresponds to each chemical reaction in a model. Event : Describe the time and form of explicit instantaneous discontinuous state changes in the model. Product: It describes the end product of the reactions in the model.